I have been reading your primitive Earth internets and enjoying some of the hilarious notions your species dreams up that they believe pass for inventions. Now, I shall do you the favor of sharing the thoughts of my vastly superior intellect about these products with your feeble Earthling minds. You are welcome! As longtime readers should be able to remember, I am an alien being from the planet Superion. Not only are my mental facilities far greater than your own: my biological system is more efficient in every way. My people consume only atoms from the air and make total and complete use of them (eliminating messy and embarrassing acts you humans must commit daily such as "poo-pooing" and "pee-peeing"). As such I am fascinated, disgusted, and driven to fits of laughter by many of the practices in which you participate involving ingesting solid and liquid matters and eliminating the unused by-products through your various holes and orifices. 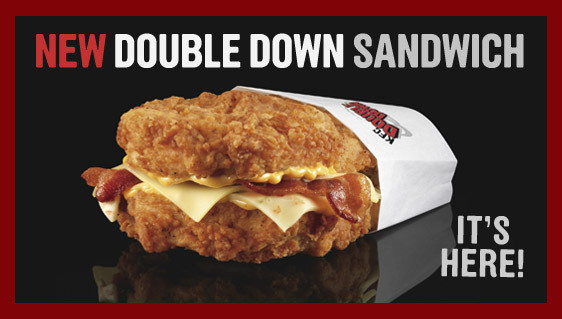 The latest astonishing human culinary creation: The Double Down from KFC. Allegedly a sandwich, the double down as replaced any kind of break (one of the defining characteristics of a sandwich) with two large pieces of mechanically reassembled chicken corpses. Between those hunks of mutilated, chemically-flavored fried fowl: strips of seared pig fat and cow milk that has been congealed into a solid. This really, is a sandwich in name only. Otherwise anything placed in between two other items of the same kind could be called a sandwich. Three fried mozzarella sticks stuck between a pair of chocolate-covered donuts? A sandwich. Thick layers of peanut butter, jelly, and chunks of cookie dough between twin glazed hams? Now you've got yourself a sandwich, Jethro. Unless I misunderstand, the purpose of consuming food is to help keep you alive. Why, then, do you keep creating alleged ingestibles that will hasten your demise? Is it because deep down you hate yourselves as much as I hate you? Here's a rule of thumb humans, avoid any food item that's name is also a synonym for "a dangerous gamble." I don't have feet, but I understand that boots are optimal for protecting your fragile human feet in cold weather, and sandals make them more comfortable in hot weather. 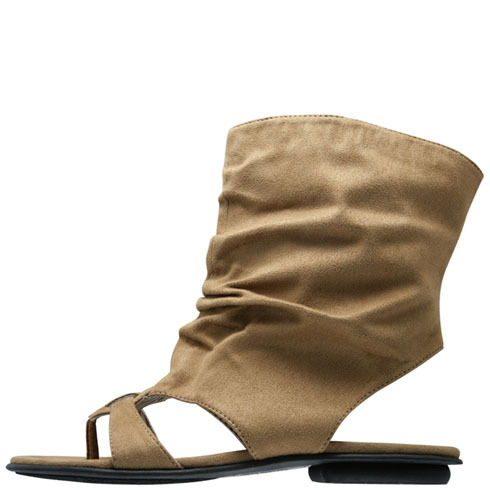 Apparently one of your genius scientists/footwear designers decided to compare traits of the boot AND the sandal for an item of footwear that would be helpful in no conditions whatsoever. Also ugly enough for no occasions. I AM ZONAR from the planet Superion, sent to monitor Earth and human culture for our eventual invasion. My kind is superior to humans in every way - intelligence, taste, and even in biological efficiency (Superions do not need to excrete waste like you Poop Machines). Enjoy my judging you, Toilet Monkeys!